PT Industri Kereta Api (Persero) - PT INKA (Persero) or known as "INKA" is a reputable state-owned company (BUMN) in Indonesia that is involved in strategic industry. INKA has core business focus on integrated railways and urban transportation industry. INKA engaged in the production of passenger and freight trains, trains parts as well as maintenance and repair services. Established since 1981, INKA is recognized as the pioneer in integrated rolling stock and automotive industry in the South East Asia region. INKA was established by the Government of Indonesia as a transformation results of Balai Yasa Lokomotif Uap of state-owned railway company PJKA (now PT Kereta Api Indonesia or KAI Group). Based in Madiun East Java, INKA now supported 2 key subsidiary companies, namely PT Rekaindo Global Jasa and PT Railindo Global Karya. INKA's head office is registered at Jl Yos Sudarso No 71 Madiun. In term of financial performance, the financial performance of INKA in 2016 showed a good improvement. According to information found in PT Industri Kereta Api (Persero) 2016 Audit Financial Report as cited by JobsCDC.com, INKA managed to record total revenue of Rp1,881.00 billion in 2016. This number is up 51.22% year-on-year (YOY) from Rp1,243.83 billion in 2015. In 2016, INKA has succeeded in booking total current year profit toRp42.60 billion, growing by 61.57% YOY from 2015 which was Rp26.36 billion. Strong understanding of risk management system, risk based audit, risk based performance and its implementations, especially in manufacture company. Strong understanding of accounting system and SAP based application as well as able to create financial report analysis. Possess certification in Chartered Accountant (CA). Strong understanding of custom clearance and transportation of export / import goods from port. Able to monitor all activities and achievement of job completion targets by suppliers. S2 Psychology (Industrial and Organization). Possess SIP (License Practice Psychology). Able to develop test kits and psycho diagnostics. Able to conduct employee counseling. Expertise with programming language and IT product development. Expertise with Windows Server and Networking. Able to conduct installation and have strong understanding of troubleshooting computer network as well as hardware and software devices. S1/D4 Mechanical Engineering, Industrial Engineering. Strong understanding of purchasing, inventory and procurement procedures. Expertise and able to read shop drawing and have strong understanding of check sheet inspection. Strong understanding of marketing concept and able to create price estimation. Able to create and analyze financial statement. Expertise with accounting computer application. Expertise with AutoCAD and able to read shop drawing. S1/D4 Mechanical Engineering, Electrical Engineering. Expertise with MS Project and Project Master Schedule. Able to perform RAB calculation and supervision in building maintenance.. 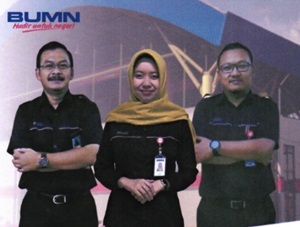 Possess certification in Ahli Teknik Bangunan Gedung. Maximum age of 40 years old for Manager and Senior Staff. Maximum age of 30 years old for Junior Staff. Minimum 7 years of experience for Manager and Senior Staff. Minimum 2 years of experience for Junior Staff. Fluent in English, both active and passive with TOEFL PBT (450)/IBT (45)/IELTS (5.5)/TOEIC (550). Have a good health, not color blind and drug-free. JobsCDC.com now available on android device. Download now on Google Play here. Please be aware of recruitment fraud. The entire stage of this selection process is free of charge. PT Industri Kereta Api (Persero) - D3, S1 Junior Staff, Senior Staff, Manager INKA June 2018 will never ask for fees or upfront payments for any purposes during the recruitment process such as transportation and accommodation.